When Muyisa arrived in 2014 at the Gorilla Rehabilitation and Conservation Education (GRACE) Center, on a rugged mountaintop west of Democratic Republic of the Congo’s Virunga National Park, she was an anxious four-year-old, with bald patches on her head from pulling her hair. It had been three years since police had rescued her from poachers in neighboring Rwanda. It took DNA testing by the veterinary organization Gorilla Doctors, which cared for Muyisa (pictured above) in Rwanda, to discover that she was a highly endangered Grauer’s, or eastern lowland, gorilla, who belonged back home in DRC. “It’s not uncommon for armed groups to kill adult gorillas for food and take the babies to sell on the illicit market or to keep as trophies or pets,” says Sonya Kahlenberg, the U.S.-based executive director of the GRACE sanctuary, which took in the orphan and named her Muyisa, meaning “luck” in the local Kinande language. GRACE gorillas comprise 14 of the approximately 3,800 remaining Grauer’s—the world’s largest living primates, whose males can weigh over 400 pounds and who are listed among the world’s 25 most endangered species. 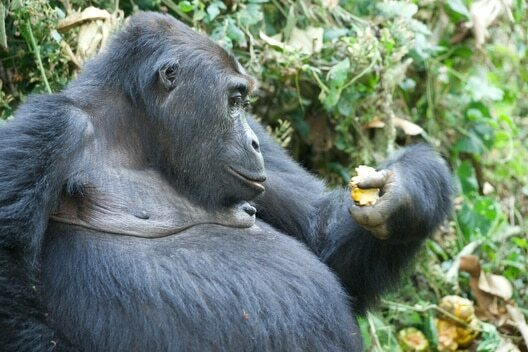 Their home range is exclusive to eastern DRC’s tropical forest. The Grauer’s population has declined across its range since the 1990s—by between 77 and 93 percent depending on the location—and disappeared altogether in some areas, according to a report released in April 20161 by experts with the Wildlife Conservation Society (WCS), Fauna & Flora International, and Institut Congolais pour la Conservation de la Nature. The major cause of their demise is killing for food, primarily by miners, who use the meat to feed their families (often due to a lack of affordable domestic alternatives) and, secondarily, for sale. The report notes that many of the miners, aware that bushmeat hunting has led to the decline of some mammal populations, would prefer other food sources, and many would like to find steady sources of income outside of forest exploitation. The International Union for Conservation of Nature reacted immediately to last year’s report exposing the extensive loss of the Grauer’s gorilla, and upgraded its status from “endangered” to “critically endangered”—a category for which it far exceeds the minimum threshold. According to WCS’s Andrew Plumptre, who analyzed Grauer’s census data collected in recent years, the definition of “critically endangered” is a population reduction of at least 80 percent in two generations, or 40 years. The Grauer’s have declined this much in a single generation. The plan includes monitoring and patrolling forestland, public education, and work with communities to reduce dependence on wildlife exploitation. 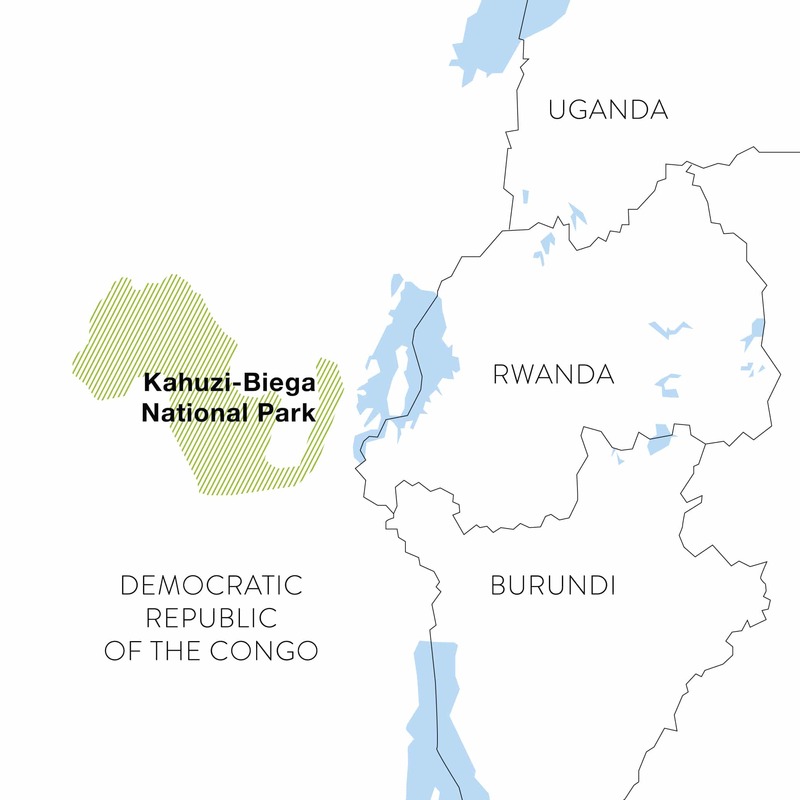 Yet civil unrest—the legacy of the war that has killed between 3.5 million and 5.4 million people since 1996—continues to blight conservation efforts in and around the national parks, including Maiko and Kahuzi-Biega, where Oscar Mianziro, a forest ranger, was killed in March last year, by armed militia. Ongoing violence has limited the locations that primatologists can reach to collect signs of ape habitation, and researchers have been forced to walk more modest forest-patrol routes, using GPS devices to record sightings of gorilla nests. Extrapolating from the density of these nesting sites, the most recent surveys, conducted from 2011 to 2015, found a decline in the Grauer’s population of more than 80 percent in Kahuzi-Biega’s lowland sector. But, the number of Grauer’s individuals in the park’s high-altitude sector, which has received greater protection because of its proximity to the park headquarters, was shown to have grown to 213 from about 130 in 2000. In hopes of spurring similar population growth elsewhere in the region, the DRC government in June 2016 established the Itombwe Reserve, home to an estimated 79 Grauer’s gorillas, south of Kahuzi-Biega. Though poaching is not yet under control, the presence of GRACE sanctuary, founded in 2010, has made it more feasible for officials to enforce anti-poaching laws, because now there is a place where rescued gorillas can be cared for. The center receives one gorilla a year, on average. Once removed from their mothers, gorilla babies cannot return to the wild because most are not yet weaned and require supplemental nutrition. At GRACE, they are placed with existing families inside 24 acres of forest, where they forage for their favorite foods, like Myrianthus, a wild fruit. GRACE’s natural setting helps prepare its residents for possible return to their original homes—an option that the sanctuary is carefully exploring. When Muyisa arrived at GRACE, luck was on her side. “We were worried that she had been away from other gorillas for too long, but she adapted just fine. The resiliency of these gorillas always amazes us,” Kahlenberg says. When Muyisa met her new family for the first time, they greeted her with a warm embrace. 1 Plumptre, A., Nixon, S., Critchlow, R., et al., Status of Grauer’s Gorillas and Chimpanzees in Eastern Democratic Republic of Congo. 2 Centre de Recherche en Sciences Naturelles à Lwiro, Centre de Rehabilitation des Primates de Lwiro, Dian Fossey Gorilla Fund, The Disney Conservation Fund, Fauna and Flora International, Forest Peoples Programme, GEAPE (Groupe d’étude et d’action pour la Protection de l’environnement), GIASI-JPE, Gorilla Doctors, GRACE, International Gorilla Conservation Programme, Institut Congolais pour la Conservation de la Nature, Jane Goodall Institute, Ministère de l’Environnement et le Développement Durable, Ministère de l’Environnement – Sud Kivu, Ministère de l’Environnement – Nord Kivu, Pole Pole Foundation International, Population Media Center, Strong Roots; UGADEC; Wildlife Conservation Society; World Wildlife Fund.